It is lovely when we get called out to properties with an interesting history. This delightful property in the pretty Malvern Hills village of Great Witley dates to the 1800’s and was once used as children’s home. The property has since been renovated and turned into a residential property. 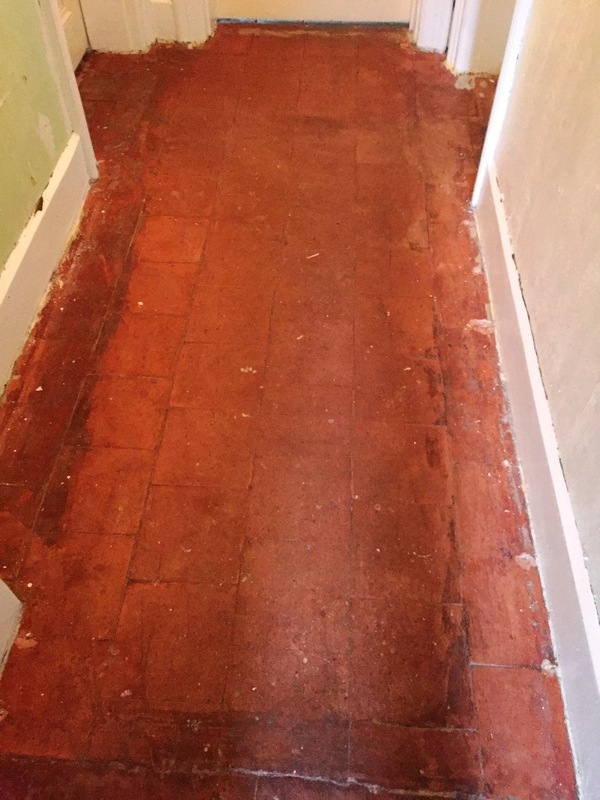 During the renovation works the new owners were delighted to peel back the carpet on the large entrance hallway and dining room to reveal an original quarry tiled floor believed to be well over 100 years old. The floor however was in quite a bad state after years of being covered with various carpets over the years and was ingrained with layers of dirt and varnish. 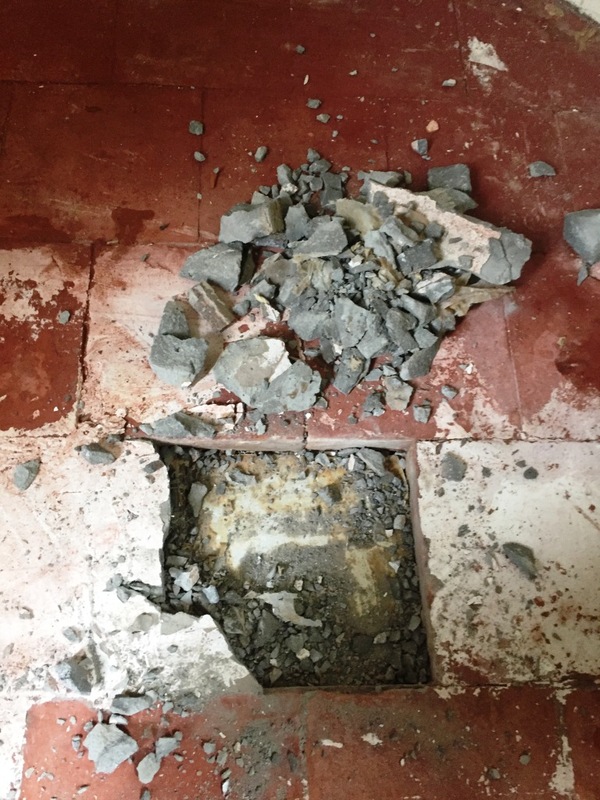 The owners were unsure if the floor could be repaired and restored and after finding Tile Doctor on-line they arranged for me to pop over and survey the floor. 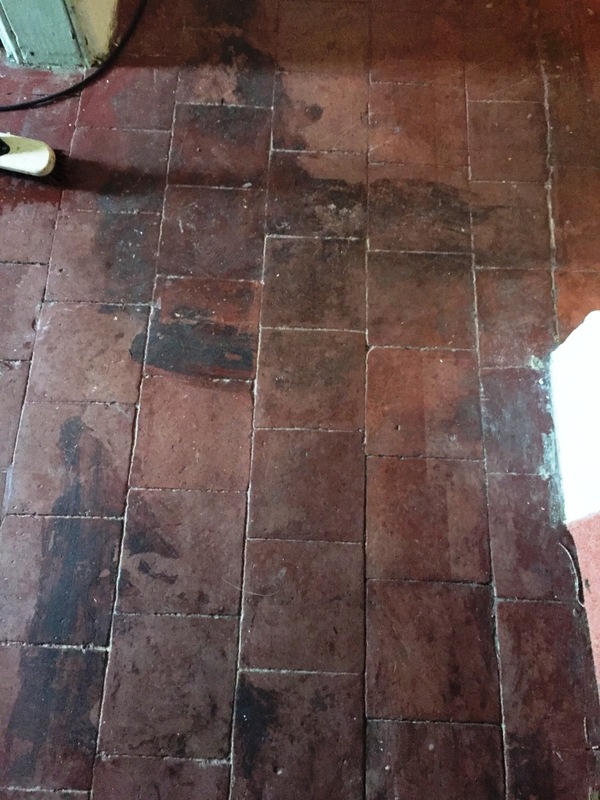 On the day of the inspection I could see that this would take some work to bring the floor back and over 20 tiles would need replacing due to salt damage or broken tiles some of which had completely perished. There was also layers and layers of white paint over many tiles from previous decoration work to deal with. 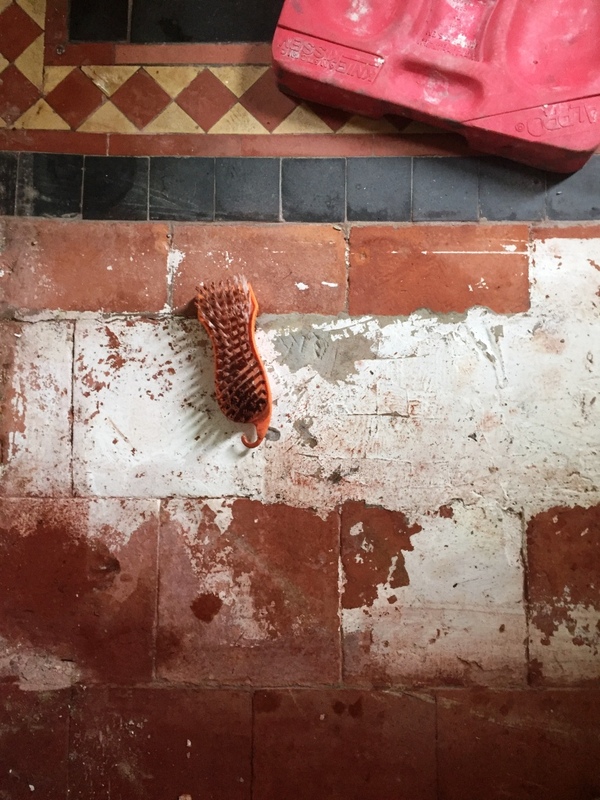 Even in such a state I was still very confident that with the combination of my own abilities, the right tools and Tile Doctor products that the floor could be restored. We discussed a price for the work which was accepted and scheduled a convenient date for me to pop round and restore the floor. My first job was to remove all the damaged tiles, being careful not to damage any good tiles. 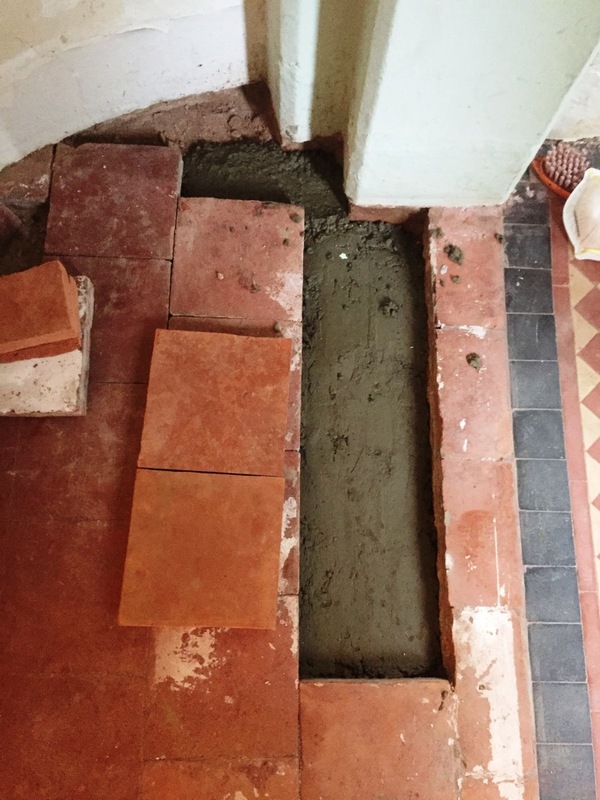 I then repaired the substrate and prepared the area for the replacement tiles which were all slightly larger so needed cutting with an electric wet saw. This work took up much of the first day and on the second day the new tiles were laid using a flexible fast setting adhesive. The area was then grouted and left overnight before starting the cleaning process. 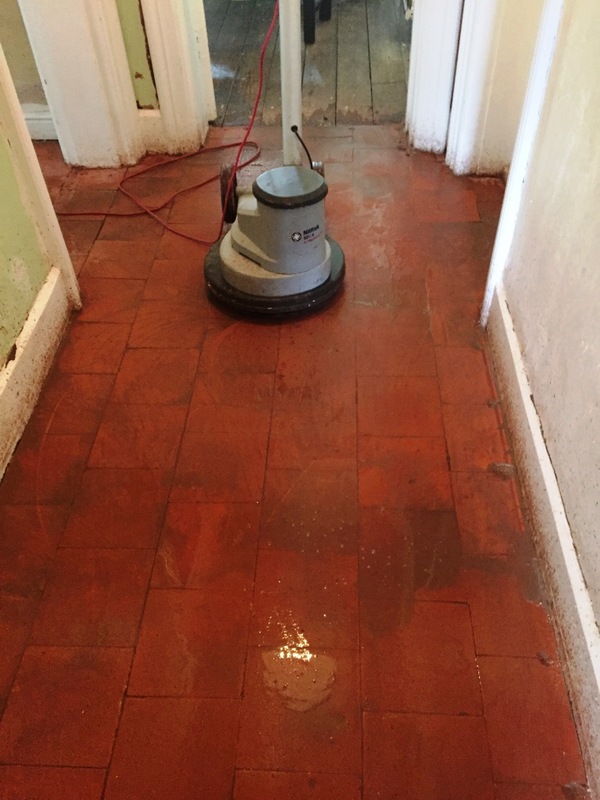 The following day the entire floor was sprayed with a dilution of Tile Doctor Remove and Go which was then left to dwell and soak into the tiles before being scrubbed in with a rotary floor machine fitted with a black scrubbing pad. Difficult areas such as the paint splashes were covered with a sheet of plastic, so the solution wouldn’t dry out and left until the paint became easier to scrape away. The floor was then rinsed with water which was the soil extracted using a wet vacuum. More work was needed to release the layers or ingrained dirt, so this was followed by scrubbing the floor with Tile Doctor Pro-Clean and then more rinsing and extracting. Last step of the cleaning process was to treat the floor to an acid rinse using Tile Doctor Acid Gel. This was also scrubbed in with a rotary cleaner before being rinsed off with water and the slurry removed using the wet vacuum. The acid rinse will counter any mineral salts in the floor and reduce the chance of efflorescence occurring as the floor dries out. Once I was happy with the floor I left it to dry overnight, the floor was already looking significantly better. I returned on the fourth day to compete the restoration by applying a sealer, checking first that the floor had dried with a moisture meter. 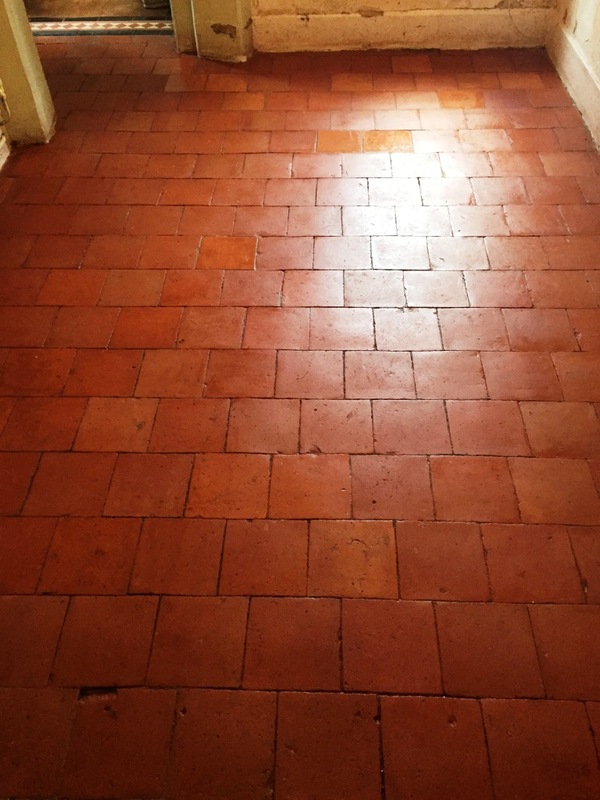 Once I was happy the Quarry tiled floor was sealed with five coats of Tile Doctor Seal and Go Extra which made the natural colours of the tile shine through without looking too glossy. This product is also fully breathable which is an important factor for these old floors where no damp proof membrane is present, and moisture needs to be able to pass through the tile unimpeded. 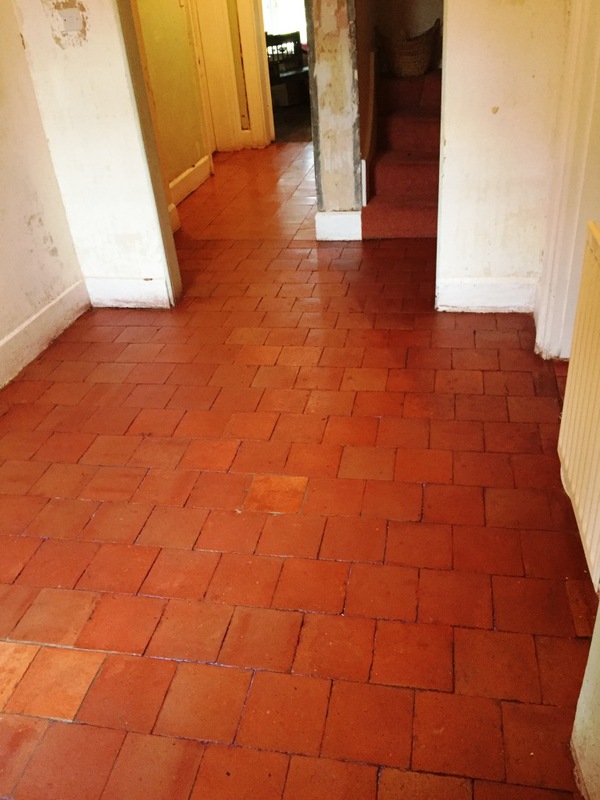 The deep cleaning and sealing process ensured the new replacement tiles blended in well with the original tiles and the whole floor was transformed back to its former glory. The client was over the moon with the results and surprised at what we had been able to achieve!